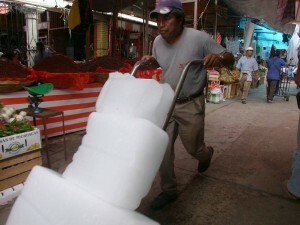 Ice was once a natural resource of some value, harvested, processed and sold on international markets. The ice harvest has vanished, but not before evolving into our modern food chain. In 1805, the 21-year-old Frederic Tudor was at a party in Boston, when his brother William playfully suggested that ice from nearby ponds could be cut and sold to wealthy customers in the Caribbean. Frederic, later to be known as the “Ice King”, seized on the idea, and the following year took a ship loaded with ice to sunny Martinique, where he taught the owners of the finer hotels how to make and sell ice cream. The ice cream sold for a hefty price, but the ice itself soon melted, leaving Frederic with a staggering loss of $4000. Not one to be easily discouraged, he learned from his expensive lesson by experimenting with different ways to make the ice last longer. He compared types of insulation, including straw, wood shavings, and blankets, and designs for storage facilities until he had perfected an ice depot that could keep 92% of its inventory frozen for a summer season. Once he had succeeded, Frederic’s business and reputation soared. For years, ice harvesters improvised techniques with pickaxes and chisels, aided by horses wearing spiked shoes, to avoid slipping on the frozen lakes. 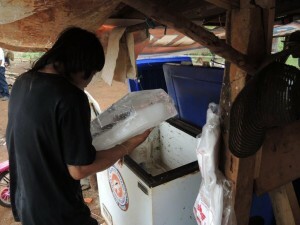 This was usually good enough to gather enough ice to be stored for sale in the summer in northern cities. Then in 1824, another Massachusetts man, Nathaniel Jarvis, invented a horse-drawn ice cutter, with parallel blades that would cut ice from frozen ponds into blocks of standard sizes, such as 22 by 22 inches (56 centimeters). This innovation allowed blocks of ice that could be loaded tightly onto a ship, without spaces in between. The ice was less likely to melt or shift in transit, and the ice trade took on a new life. Ice began to be shipped to Charleston, New Orleans and other southern cities (especially to chill beer and preserve fish during the long, hot summers), but in one bold experiment in 1833, Tudor shipped 180 tons of ice to Calcutta, where he built a large ice depot to house his product. Residents of India could now buy an insulated box, and stock it with a block of Yankee ice that would keep food and drinks cold for days. By 1856 over 130,000 tons of ice were being cut from ponds around Boston and shipped not just to India, but also to Latin America, the Caribbean, China and the Philippines. But that same year, spurred by the profits to be made from ice, a British journalist, James Harrison, invented a practical, coal-powered ice compressor in Australia. “Natural ice” (cut in the wild) and “plant ice” (from factories) competed with each other in an expanding market. In the 1800s, some railroad cars and ships were fitted with ice-holding compartments that allowed fresh meat and other perishable produce to be shipped long distances. At first, consumers preferred natural ice, believing it was cleaner and longer lasting, and it wasn’t until 1914 that plant ice in the USA gained dominance. Relatively inexpensive electrical refrigerators came onto the market in 1923. Once consumers had refrigerators, they no longer had to buy ice. After a century of lively commerce, the spectacular long-distance and large-scale trade of natural ice finally began to decline and eventually collapsed in the 1930s. However, the ice trade has left the modern economy with a legacy: the commerce in fresh food which continues to this day, although it is now based on refrigeration, not natural ice. 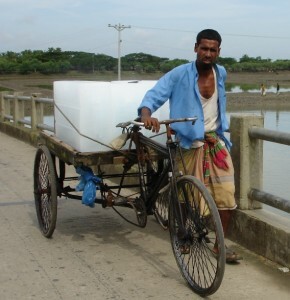 And of course there is still a niche market for factory-made ice, sold for picnics, and (especially in developing countries) to fishmongers and other small-scale food dealers. The ice trade also led to another innovation, the ice box, which allowed homeowners to keep food fresh, stimulating the trade in produce from countryside to town. Modern supermarkets with ice cream, frozen fish and fresh meat presuppose that the consumers have a refrigerator at home. Today, tropical countries like Ghana export mangos and papayas to Europe and North America. Because of refrigeration in Central America, more farmers are able to sell fresh produce to large, new supermarkets in cities like Tegucigalpa and San Salvador. You can now find tropical produce in refrigerators around the world, and in a sense it started when a student at Harvard joked with his brother about shipping frozen pond water to the Caribbean. Boorstin, Daniel J. 1965 The Americans: The National Experience. New York: Vintage Books. 517 pp. Cummings, Richard O. 1949 The American Ice Harvests: A Historical Study in Technology, 1800–1918. Berkeley and Los Angeles: California University Press.